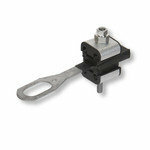 Tension clamp for the anchoring of 4-core overhead cables to poles or walls by standard hooks. Tension clamp is equipped with a spring and shear head screw to make the installation easier. 4 kV / 50 Hz / 1 min.